Hanko Tennis Club hosts the southernmost tennis stadium in Finland situated in the sunny city of Hanko, surrounded by water. Developed through decades Hanko tennis stadium has become a hugely popular destination for those who want the best in tennis summer can offer. Here You find high class premises, beautiful surroundings, tennis schools and other sports related services, all in the center of a vibrant seaside resort that attracts thousands of visitors each summer. Besides excellent conditions for tennis, in Hanko You can enjoy golf, beach life, sea safaris, karting, excellent dining and night life and at the end of the day beautiful sunsets for Your enjoyment. Tennis got a foothold in Hanko sometimes in the beginning of the 1880’s when the Spa built grass courts on the site where the current clay courts are situated. The first indoor hall was built in 1897. First official lawn tennis championships were held 5-6.8.1905 and the singels championship was clinched by Captain Torsten Kurtén. This tournament is regarded as the first tournamnet not only in Hanko but also in the whole of Finland. Eight grass courts were available at that time. Hanko Tennis Club constitutive meeting was held 20.4.1911, setting a strong tradition fostered by the current Club. In 1912 Hanko Tennis Club had the honour to arrange the Tennis federations first championship tournament which was won by Boris Schildt. In 1914 Hanko Tennis Club arranged again the championships at the end of july, just before the beginning of World War I which began 1.8.1914. These championships were the start to Hanko Tennis Week. Because of the war tennis was not played in Hanko for years. When the war ended the Spa including the tennis courts were repaired. In 1929 club activity ended due to financial difficulties. The tradition of the Club was then taken care of by the tennis section of Hanko Sports Club. The Sports Club let build new courts at the parkland pond close to the Spa. In following years championships were arranged by the Sports Club and the Spa jointly but also separately. In 1938 Finnish National Championships were played again in Hanko, but war ended once again Spa activity and also tennis. In november 1940 Hanko was handed over to the Soviet Union as a navy base. At the end of year 1941 the Soviet Union evacuated the navy base and once again a period of clearing up and rebuilding started. In 1940 the tennis section of Hanko Sports Club had ceased in exile. In 1944 Hanko Tennis Club was founded by enthusiastic locals. The old Spa had burned down during the war and it was never rebuild. The tennis courts connected with the Spa were repaired and the yearly championships were replaced with Hanko Tennis Week, held in july, a tradition that lives on. The tournament held in 1951 though was the first tournament officially named Hanko Tennis Week. The clay was delivered from Karkkila brickworks and volunteer spirit was high among club members. Court lines were made from roof felt cut in stripes which were painted white and nailed to the ground. In the 1950’s an indoor court was built in the Casino (The Casino was built close to where the Spa had situated). In the 1960’s tennis started to gain popularity among a larger crowd. The Finnish tennis elite and A –class players adopted the tournament and it became a kind of tennis festival for the whole family. In the 1970’s the character of the tournament changed in a more professional direction and in 1982 the first professional tournament was arranged in Hanko. In the 1984 tournament the prize sum was 50.000 USD as it was in 1986. In 1990 the tournamnet had already Challenger status and the prize sum had climbed to 75.000 USD. Clay courts 1–3 and the three courts at the parkland pond (converted to sand/artificial grass) were repaired in 1991. At that time the prize sum for the tournament had declined to 50.000 USD. Because of tax issues a new club had to be founded and it was named HTK-Tennis. The years of professional tournaments were now over, although later on for a few years a smaller ITF-tuornament was played. In 2004 a new clubhouse was built and the old name of the club, Hanko Tennis Club, was restored. In 2005 one hundred years of tennis in Hanko was celebrated and in honor of this event a centenary history was published, compiled by Eki Leikoski, Babsu Wikberg and Tomi Ristikangas. In 2006 a new warehouse was built and in the same year the club had the honor to arrange the Davis Cup match Finland – Morocco. Led by captain Jarkko Nieminen Finland took a 3-2 victory. In 2008 the club arranged the Davis Cup match Finland – Luxemburg, which Finland once again won 3-2 with excellent performances by Jarkko Nieminen and Henri Kontinen. In 2009 the courts at the parkland pond were renewed and coated with plexipave. 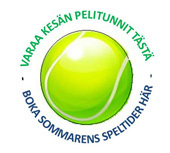 In 2010, for the first time in Finland, an ITF subordinated senior tournament was arranged by the club, including all age classes (5 categories). This tournament has become hugely popular, attracting senior tennis players from several continents. The work to promote tennis in Hanko and also Finland goes on, in good spirit between active members and the Board of the Club. Tournaments, coaching and social activities are held throughout the year. The Club had 399 registered members at the end of year 2017.